The Bay (launch from the Harbor Walk next to Morro Rock. Park at the parking lot across from the 3 tall stacks). When: Higher tides make for easier paddling. 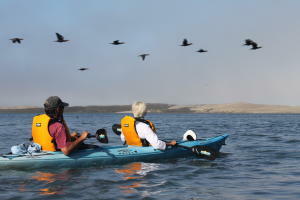 The higher the tide, the further you can paddle into the estuary. You can check out the tides here: TIDE CALENDAR. Certain times of day have less wind. Mid-morning is typically calm and is the best time to go. The wind tends to pick up during the afternoon. Feeling adventurous? 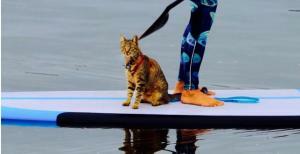 Try a SUP Yoga Class! Find out more HERE. Where: Morro Stand Beach (park your car at Morro Rock). When: Morning has the best wind conditions, especially during springtime. Wind tends to pick up in the afternoon. How: Feel more than welcome to bring your gear from home. 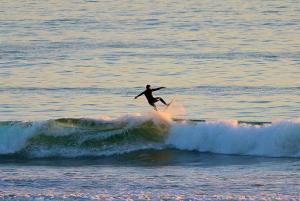 Or, rent or buy a surfboard from AZHIAZIAM, Wavelengths Surf Shop, TKD Surf Shop. When you stay in a hotel (now through May), you will receive a complimentarySpring Passport. Enjoy an array of deals around town, including $5 off $25 purchase or rental at AZHIAZIAM. Use this to get pro surf gear for less! Certain times of day have less wind. Mid-morning is the best time to go. The wind tends to pick up during the afternoon. Where: Morro Strand Beach (You can walk all the way to Cayucos on this beach). There will be plenty of space to run and fly. 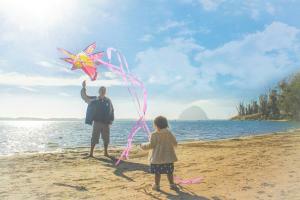 When: Spring and summertime set the best stage for a day filled with kite flying. The warm sunshine and longer days excite both expert and beginner flyers alike. You will not want to miss the Morro Bay Kite Festival, held on Morro Strand Beach on April 27-29. This is a family-friendly FREE events for kite enthusiasts and beach lovers. Check out the schedule of events HERE. How: We would love to see your handmade kite flying on the beach! Or, purchase one at our local kite shop, Farmer’s Kites, Surreys and More. Where: Find tide pools at the end of Toro Lane in North Morro Bay. There is a parking lot and a well-marked trail to the beach to find your way. You can also walk north up the beach from Morro Rock to stumble across this beautiful showcase of nature. 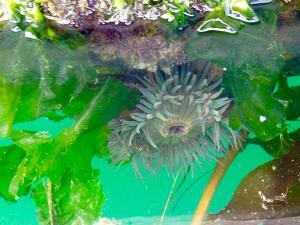 When: The creatures that thrive in the pools are visible during low tide. Check out the TIDE CALENDAR to find the best time to visit them. How: No gear needed! However, many visitors enjoy taking photos of the unique creatures they find within the pools. When you post your photos, #MorroBay or @morrobayca for a chance to be featured on our social media pages.